White hair grows four times faster than normal hair. The first silvery strands usually pop up around age 45 -50 but premature graying can begin as early as 5 years for some. With Graying of hair, hair texture also changes. It becomes dry and coarse. Grey hair is usually associated with ageing, which is natural process, but this is not always the case. According to medical science everybody has malenocyte in skin and hairs, bulbar malenogenic cell in roots of hair when stop producing melanocytes then hair turns grey & later on white. White hair is just keratin. Keratin is a transparent and colorless substance our nails are made up of keratin. According to age and other factor these melanins decide color of hair. 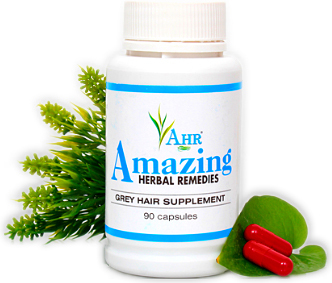 According to Ayurveda Grey hair is caused by imbalance of pitta dosha in healthy human body. When more than half the hair is white by age 40, this is considered premature. People with pitta body humor type are prone to be affected by this ailment. Faulty diet -lack of Vitamins, Iron, Copper and iodine in the daily diet. 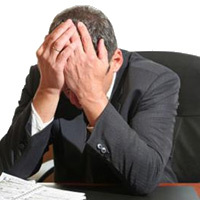 Mental inflluences-Anxieties, fear, jealousy and failures, tension, stress. Chronic illness-thyroid disorder, vitiligo,Chronic cold, sinusitis, Anemia, chronic constipation, chronic headaches and restlessness forces the hair towards graying. Improper hair care – use of chemical based hair colors & products. 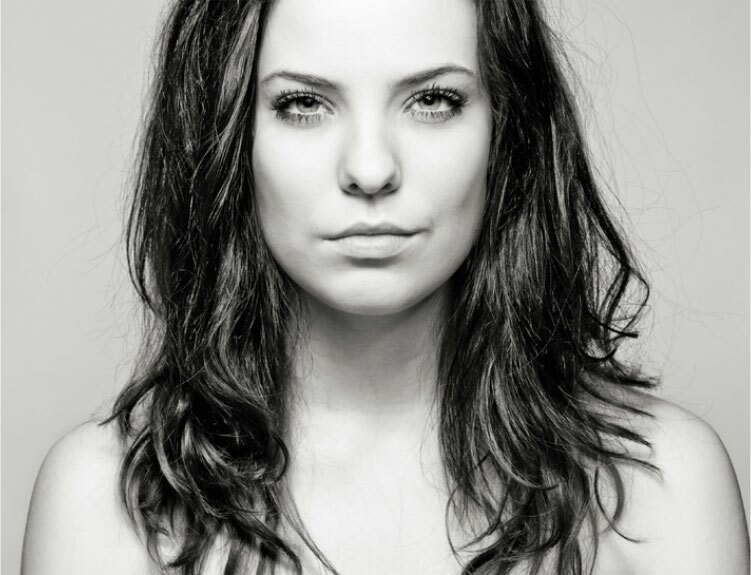 Ayurvedic Experts formulated and tested to prevent and reverse grey hair. Revive hair pigments and cells at the root. Also targets major causes like chronic cold, sinusitis, anemia & hormonal disturbance. Also makes hair thicker & healthier. Supplement Intake: Consume Supplement (3 capsule) twice or thrice a day with milk or any other milk preparation. Directions to use Gray Hair Oil: Message the Herbal Hair Oil gently with the finger tips in the roots of the hair. Each application should cover the scalp completely. Can be used on all affected areas including the scalp, beard and chest. Apply it once a day at night and wash it in the morning, preferably with Amazing Herbal Hair Shampoo. Results: You did not become gray overnight. The most safe and effective way to treat your gray is by gradually reversing the process. Our products work gradually. Results will vary by individual depending upon the gray hair percentage. Users who have not used any hair color & henna can see a color change within 30-40 days. For those who are using hair color & henna may see a color change within 60 days. Women may receive results sooner than men. Scattered gray may take sooner. Solid gray areas may change longer. However, treatment time varies from 4-12 months. Herbal hair oil opens blocked capillaries thus improves the blood circulation of the scalp that gradually restores lost color & prevent further grey hair. Grey hair treatment oil gives necessary nourishment to the roots of hair, moisturize the hair and scalp which helps to prevent the further graying of hair. 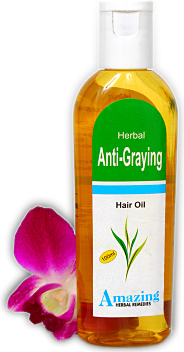 Herbal hair oil repairs damaged pigments to treat gray hair. Massage the Herbal Hair Oil gently with the finger tips in the roots of the hair. Each application should cover the scalp completely. Can be used on all affected areas including the scalp, beard and chest. Apply it once a day at night and wash it in the morning, preferably with Amazing Herbal Hair Shampoo. Hibiscus is known for helping in recoloring the hair. 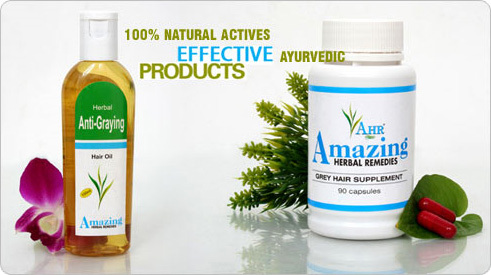 In Ayurveda it is indicated in cases of premature hair loss and graying as it has property of stimulating hair growth and controls excessive hair fall. Bhangra one of the most widely used herb of Ayurveda used in almost all classical Ayurvedic formulations for hair care. It has excellent properties for restoring hair, its natural health through revitalizing hair follicles by stimulating blood circulation which is the prime objective of hair rejuvenating formulations. In a nut shell, this herb promotes the hair growth & is known for hair darkening properties. According to Ayurveda Chronic cold, sinusitis, Anemia, chronic constipation, chronic headaches and restlessness forces the hair towards graying. Following are few tips that helps in reversing grey hair. Benefits: Mandukasana is very good for premature greying hair and help to stop further greynig of hair. It is also useful for some other illness like constipation, diabetes and digestive disorders, effectively reduce weight of thighs, hips and the abdomen. This asana strengthens the lower parts of the loins. Take Vajrasana position with both the legs bent. How to release the stretch. Vitamins and minerals play a important role in the function of the body, there are certain vitamins play a major part in helping to maintain a healthy head of hair and the scalp. Para-Aminobenzoic Acid (PABA)- found in foods such as liver, kidney, whole grain and yeast. Biotin- egg yolks. liver, milk, yeast and soybeans, Swiss chard, tomatoes, romaine lettuce, and carrots. This includes almonds, eggs, onions, cabbage, cucumber, cauliflower, goat’s milk, cow’s milk, raspberries, strawberries, halibut, oats, and walnuts. Zinc has also been shown to stop hair turning grey. Wheat germ, yeast, pumpkin seeds, oysters and mussels, shrimps and egg yolks. Vitamin E has also been shown to retard the ageing process. It has been suggested that grey hair is a symptom of body degeneration so a supplement of vitamin E can only be beneficial whether you have grey hair or not.The best natural sources of Vitamin E are wheat germ, Soya beans, broccoli, brussel sprouts, spinach and eggs. Natural Sources of Vitamin E, Whole wheat bread, Whole grains, Wheat germ, Milk, Raw or spouted seeds, Asparagus, Broccoli, Brussels sprouts, Butter, Egg yolks, Leafy greens, Olives, Soybeans, Sunflower seeds, Nuts, Vegetable oils. Always, keep in mind hair are an essential part of our body and need special attention and care. Handle your hair gently. Whenever possible, allow your hair to air-dry naturally, Avoid compulsively twisting, rubbing or pulling your hair. One Teaspoon of dried amla with honey twice a day. wash hair with amla powder. Add henna leaves to some mustard oil and heat gently to make an easy homemade medicated hair oil. A massage of sesame oil on the scalp improves hair growth and could prevent premature greying and hair loss. Mix powdered dried amla in lemon juice apply on scalp. Take trifla (harad, baheda, amla) churn every day with luke warm water before to sleep. i have a lot of white hairs & hair falling on my scalp i used some of the product chines & herbal but doesn’t work. please, Which product will work?